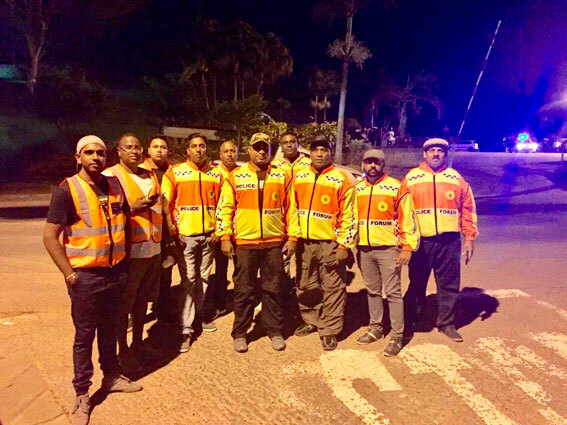 The greater Chatsworth community took to the streets on Saturday night for two hours in a show of strength in their fight against crime and to reclaim their streets from criminals. Operation Lockdown was heralded as an unprecedented success on 23 March after a call was made by eThekwini Secure for the community, neighbourhood watches, community police forums and strategic partners to unite on one platform. The call was heeded from as far afield as Ramsgate, Port Shepstone and Pietermaritzburg, with an estimated participation of about 1000 people. Imtiaz Syed, eThekwini Secure and eThekwini Cluster CPF chairperson, said that the project was unprecedented indeed. “This was historic. When we look at ourselves in our own little areas, we seem few, however, in the collective we are strong in numbers. “This is the kind of relationships that we need to build across communities as we speak one language in the fight against crime. Everyone needs to get involved, including our women and children. Everybody needs to be empowered. “The measure of success is determined by the people involved. For two hours on one night, we forgot all our differences and came together as a single component of a community. Strength in numbers was realised. If we could achieve this once, we can do it always. “We have proven that we can overcome crime in our areas. May we continue to grow in strength as one united force in our efforts to keep our areas safe. A simple thank you cannot express our gratitude,” said Syed. Kassim, who was Chatsworth Lockdown coordinator said: On behalf of the Chatsworth Secure administration team I thank all the members who attended the lockdown operation. It was a very well coordinated operation with some of the major role players of our community and this operation was a clear indication of all the leadership in Chatsworth. He said that such projects cannot be a success it if was not sustainable. “This is where our next duty lies. It’s now upon us to take further proactive measures to keep the unity going and I hope that we can achieve this together. “We are thankful that Chatsworth SAPS and metro police are always in support of any crime awareness and prevention campaigns we host in the town. “The Community Policing Forum of Chatsworth has an excellent working relationship with all law enforcement. With this partnership and collaboration we can reduce crime collectively. “Thank you to one and all that participated. A simple thank you cannot express our appreciation,” said Kassim.